Autumn is such a giving season for a gardener! The summer crops have tailed off, but everywhere there are fallen leaves, which are actually repositories of carbon, nutrients and tiny creatures. They're easy to collect and store, too. Before I launch into how to use them, a little acknowledged fact: they are even better collected from your neighbour's lawn than your own. I have a couple of neighbours who don't want the leaves but don't care enough to clear them themselves. These are the best type of leaf-neighbours, because those who want the leaves, or obsessively don't want them, will have only scanty pickings. Those people have already been busy raking (or using a leaf-blower - I just have to look away). 1. My children were playing with their children for the first time in a year. 2. I'd seen and chatted with the mother for the first time in ages. 2. I'd talked to another gardening neighbour who was strolling by. His mother, he said, wants to get chickens. I'd invited her around to see ours so she can get some ideas for coops, garden protection etc. 3. The gardening neighbour had given me a big bag of feijoas. 4. I was warm from the exercise and felt well-friended. 5. Their front lawn looked much tidier. 1. Dumped a big bagful in the chicken's fenced-off run. The rain and cool weather had turned it into a hard, desertified soil pan. It's mostly under evergreen trees so gets some leaf drop, and we chuck weeds and small prunings in there, but chickens need stuff to scratch through all day every day. They were transformed by the leaves, their red combs jiggling as they scraped and pecked, scraped and pecked. Ah, some jungle floor at last, thought the junglefowl descendents. 2. Mulched the garden. 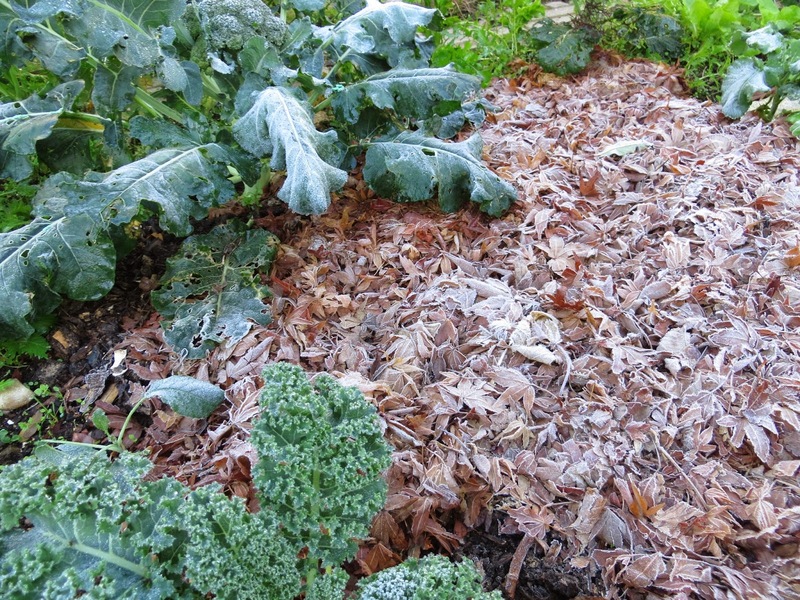 The books say that autumn leaves should be shredded before being used as mulch because otherwise they turn into a solid, almost waterproof layer. I guess I'll find out. We've had big winds since then and my first fear - that they'd be blown away - turned out to be unfounded. I don't know why they didn't get blown away, but they haven't turned solid yet. 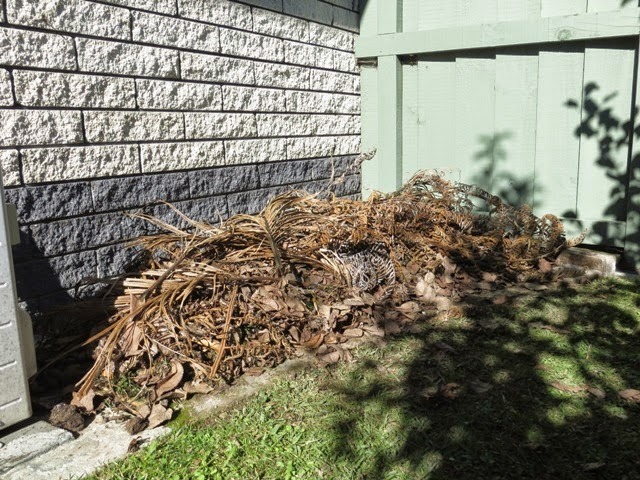 This photo shows a mulched part of the garden. Underneath Ian planted garlic cloves, which will send up their shoots above the mulch soon, we hope. Of course what we really want from mulch is to suppress the weeds, build up a lot of healthy creatures, including microorganisms, underneath (don't mention the slugs), and hold in moisture. Our frosted garden this morning. 3. Sat a bag of them next to the current compost bin to use as the brown layers needed to balance out the green layers (kitchen scraps, weeds etc). More bags will be stored so we have enough brown material to last until next autumn. 4. Used them to 'sheet mulch' a garden, also known as lasagne gardening. This is a way of creating a garden with wonderful soil. A fortnight ago this corner housed just lawn and a dead tamarillo tree, both of which perched on top of clay. 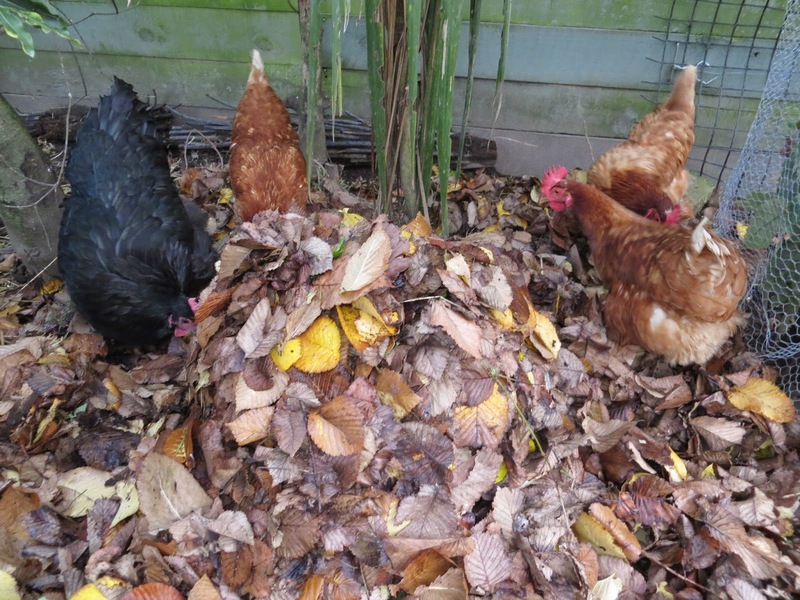 I laid down layers in this order, from the bottom up: blood and bone, lime and animal poo (chicken and guinea pig, donated by my friend), then cardboard, then compost, leaves, our own chicken poo, grass clippings, leaves, grass clippings, compost, leaves. I stacked the fern fronds on top to hold the leaves in place (again, no faith that the leaves won't blow away). In a few months it will be stunning soil filled with microorganisms. I'll plant another tamarillo tree there in spring. 6. For the decorative autumn crown use of leaves, see the bottom of this post. 7. Our most favoured leaf-neighbours are yet to offer up their leaf fall - the tree is still glowing red with its leaves. Their tree doesn't drop until June. Here's a photo from last year - the best reason of all to rake up neighbour's leaves! Feel free to come and help yourself to our over abundant supply Andrea. I mow the leaves first - either on the lawn so they are combined with grass clippings, or straight on the concrete :-) - then pile them on the gardens or add to the ever increasing pile in the compost heaps. Unmown leaves form a dense mat around here, especially the ginko leaves. I don't mind mowing them first, good exercise for me. But we still have trees heavy with leaves so there are plenty to share. I am hoping another good storm will see most of them come off. Thanks Bev, I might do that. What fun the girls could have in the piles I make!